TIP: Cut the amount of baking powder in half if you find you can taste it in the final product. For a link to “Rustic Raisin Bread,” see Rural Route Lupiac‘s blog. Looks fantastic! In large bowl, whisk together dry ingredients to combine well – really well. Add water and stir with a spoon until a wet, sticky dough forms. Seal with lid or plastic wrap and set aside for 12 to 18 hours. TIP: Really, you don’t need to give it so much rising time since gluten free bread will not rise all that much. An hour in a warm place will do, but we like to keep this step because it adds a bit of sourdough flavour. While pot is warming, remove dough from bowl and shape into a ball on a rice floured surface. After pot is heated, remove it from the oven and drop in the ball of dough. Cover and return to oven for 30 minutes. Then remove lid and return to oven for another 15 minutes. TIP: Eat this within a few hours because the loaf does not keep. We have now posted a second crusty bread recipe. See gf and me’s crusty bread II. Or try our gluten free rustic bread. Another easy and lean recipe and we find the resulting loaf even tastier! Don’t forget to LIKE us on facebook. 2 to 3 recipes delivered to your inbox every week! This is a conversion of a recipe from simply so good. This entry was posted in Baking, Breakfast & Brunch, Lunch and Dinner, Recipes and tagged bread, dairy free, dutch oven, gluten free. Bookmark the permalink. Looks good! My husband has made no-knead bread for years, and that was something that was hard to give up. We’ll have to give this a try! Thanks. Please let me know how it goes! I’ll be pinning this! Thanks. Oh, a treat. Crusty bread! I would have loved to have this with my lunch today! I can’t remember the last time I’ve had bread like this, and I miss it! We felt the same way when we made it the first time! You just know I’m going to attempt a low calorie version! Thank you. I figured you would! Let me know how it goes! Oh my gosh, can’t wait to try this! Thanks. It is really good – and really easy. Just takes time! I’ve not been game enough to make my own gf bread without a bread mix to help me. But this recipe looks great – I might just have to try it! It is really easy and very good. The hardest part is the waiting! gf and me, do you have any suggestions for an alternative baking pan? I don’t have a small covered Dutch oven or Le Creuset pan. Mine are way too big for this. I’ve made the original (large) wheat version of this before in my Le Creuset pan so I’m familiar with process but I’ve never tried it gluten free. Do you think a small but deep casserole pan (it has a lid) would work? Yes, I would think so. Let me know how it goes and if you make any adaptations – I’ve been thinking about your roux idea but haven’t got round to trying it yet. Hope you enjoy! Oh wow, that looks amazing. What a really useful site this is! Thanks so much. Hope you enjoy your visit! This looks and sounds fabulous. I don’t have a cast iron dutch oven (gasp! I know…) but I’m heading to the cookware store at noon to buy a food mill, so I may as well buy a dutch oven at the same time and try this. Can’t wait! Hope you like it as much as we do. The texture is a bit heavy but the flavour is the best of all the gf breads we’ve tried. We’ve never tried it, but a glass casserole should work if you don’t have a dutch oven. Oh and we’d love to know how hte mill works. Been thinking about purchasing one too. Awesome and can I just say I LOVE the look of your blog…like a chalkboard amazing and happy to be following your blog…thanks for following mine earlier. Will try! Is there any way I can use active dry yeast? I would think you should be able to just replace one with the other. GF breads never rise more than once and honestly, the yeast is here for the flavour more than anything! Please let me know how it goes. It is very easy but it takes planning! Thanks for visiting my blog, and directing me to yours. I am going to try this bread, and if we can’t consume it all fresh, I expect it would be good as a base for a bread dressing . I am sure it will. Good tip. And it does make a pretty small loaf. Wow! Fabulous. Cannot wait to try it. Thank you!!! (And thank ou for visitng my blog – so glad I found yours too). How could you not like your statement that “The way I see it, you should be able to turn out professional, delicious products in almost any small, simple kitchen.” I look forward to your recipes! And photos! Thank you for visiting my blog. I appreciate your positive feed back. I look forward to trying your gf bread recipes. They look yummy!!! GF bread is a mystery to me, so I always appreciate finding someone who has done the work and is kind enough to share. 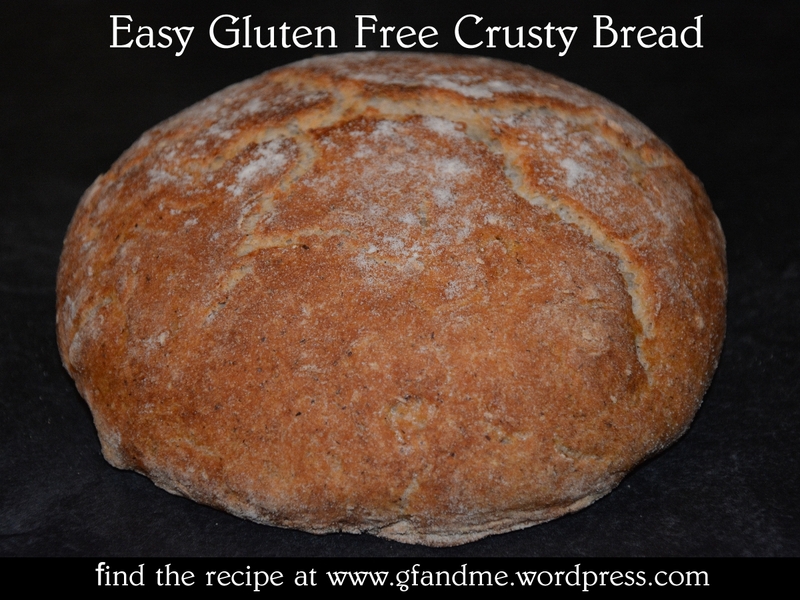 I’m going to give this a try tomorrow – please follow gfandme for more gf recipes, they look wonderful! I make regular bread all the time using a biga. I am going to try your formula and am very happy to have it when I need to serve gluten-free bread. It looks delicious. May I inquire what the xanthum gum is for, chemcially? Does it help to bind the dough so it keeps its shape? Many thanks, gf! Exactly. The xanthan gum replaces the gluten and helps hold everything together – although it doesn’t really help to hold the air produced by the yeast. Theoretically you can also use guar gum, but we haven’t had much luck with it ourselves. This looks like a fabulous bread! Such a lovely colour! Thanks. It is very good! This looks incredible. And sourdough, to boot? My favorite. Oh, how I do miss bread sometimes. It’s not true sourdough but it does have a slight sourdough taste. And I know what you mean about bread. It seems to be the most difficult thing to replicate without gluten. OOOOhhh this looks easy and good. The list isn’t as long as my arm, like most gf recipes too! Thanks. To make it even easier you can cut the baking powder in half too! It would be fabulous for dipping in oil and vinegar. I have never made cheese fondue so I am not sure what would be appropriate. This bread is fairly heavy. If you are looking for something lighter, you could try our cheese rolls.